Introduced in 1948, the Ford F150, currently in its 15th generation, is without a doubt the most popular motor vehicle in North America. In fact, the Ford F-Series is the best-selling line of trucks in Canada, and is the winner of the 2018 Motor Trend Truck of the Year. Wayne Pitman Ford Lincoln has been selling the Ford F150 for over 41 years, and has firsthand experience with the reliability, uncompromising quality, and performance of this incredibly popular pick-up truck. The Ford F150 is built with military-grade aluminum and other weight saving measures which help to make the vehicle 700 pounds lighter than other trucks, without losing any of its rugged ability. The aluminum body of the new F150 also ensures its longevity, even in the harshest of environments. Unlike other steel trucks, the F150 will not rust or corrode with exposure to winter salt, job site dents, or accidental paint scratches. Ford completed extensive testing on the F150 by having it pull trailers and haul loads through deserts and over mountain passes to ensure that it was reliable — and it passed these tests with flying colours. The F150‘s lighter body allows for a wider variety of engine options, ranging from ultra fuel efficient to extremely powerful. 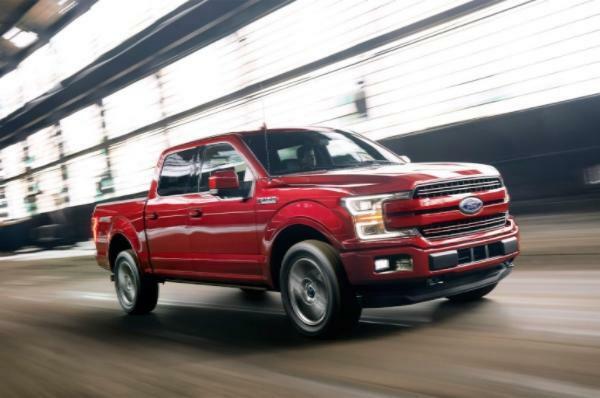 The new model F150 produces 290hp and 265 lb-ft of torque, and the second generation 2.7-litre EcoBoost V-6 produces 325hp and 400 lb-ft of torque. Featuring twin turbochargers for on-demand power, this vehicle is able to provide strength and power with enhanced responsiveness, unlike any model before it. If you are looking for even more power, then the 2018 3.5-litre EcoBoost V-6 is what you’ll want. The 2018 model is able to tow 13,200 pounds — that’s 1,000 pounds more than the 2017 model! Drivers love the safety of the F150. You sit high up on the road and feel in command — and it’s more than just a feeling The 2018 Ford F150 has earned the Insurance Institute for Highway Safety’s Top Safety Pick Award. The Ford F150 provides standard safety features including ABS, traction control, and airbags, and for those who find driving a large truck difficult, a 360-degree multi-view camera system and a rear parking sensor will help you maneuver into any tight parking space. For anyone who worries about backing a trailer up, those struggles are a thing of the past with Ford’s Trailer Backup Assist. The Ford F150 offers flexibility with the ability to customize its features without sacrificing comfort. At Wayne Pitman Ford Lincoln, we carry a wide variety of F150 models because we understand that each person's needs vary. Just as we value our relationship with you, we know that you value the relationship with your vehicle. Ford models can be adjusted to your preferences, with different cab style and bed lengths, off-road packages, self-parking, retractable running boards, smart cruise control, power tailgate release, tailgate step, and more. If you want a vehicle that will stand the test of time, then we recommend the Ford F150. Visit us at Wayne Pitman Ford to take the F150 for a test drive today!